For assignment 3, students analyzed and compared a portion of the Twitter “conversation graph” and the “interest graph”. Conversations were found by looking for Twitter “@mentions” and interest graph by looking at the friend/follow graphs for a user (finding friends of friends, taking a k-core analysis, and closing the triangles). The attached document highlights many of the students’ work. One of the most impressive graphs was made by Achal Soni. He used Java and the Twitter4J library to obtain 3000 tweets for 4 rappers (Drake, Kendrick Lamar, J Cole, and Big Sean). He extracted @mentions from these tweets, and created a graph recording edges were between the celebrities and who they were conversing with. To compare the interest network with the conversation network for these celebrities he looked at the friends of each of these celebrities, and classified all of these relationships into 3 categories per celebrity: users who they followed but didn’t mention, users who they mentioned but didn’t follow, and users in the intersection. This was repeated for each of the celebrities. 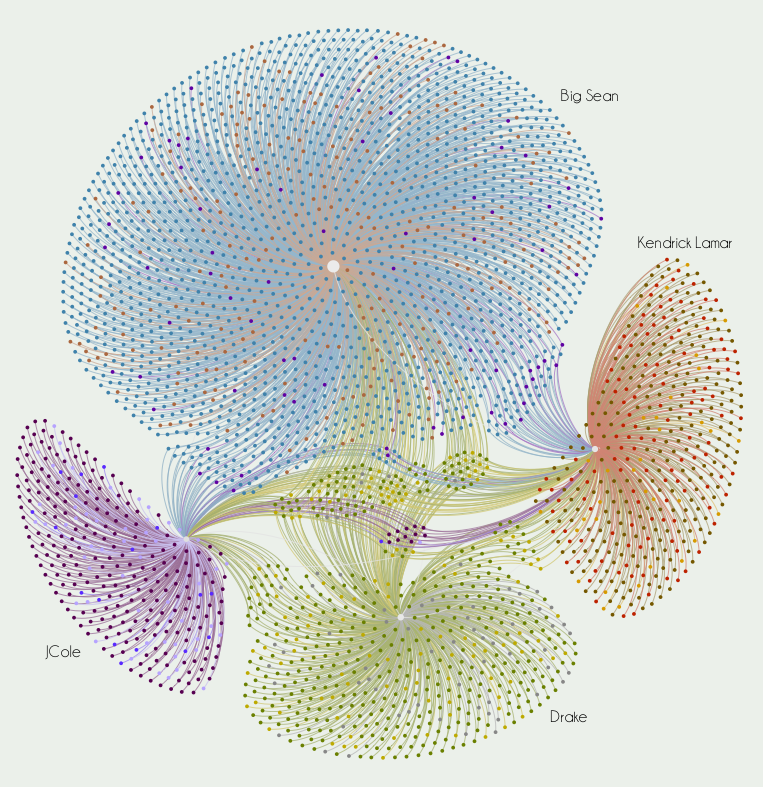 To see what it would look like to compose the relationships for all four celebrities into a single network, he input the combined graph into Gephi. The results were surprising, and phenomenal! The layout algorithm beautifully clusters each of the celebrity’s networks together, and keeps the shared components in the middle. Each network is composed of nodes of different colors (3 colors each). Each of these colors represent which category the node is associated with belongs to (whether it is a friend of the respective celebrity, somebody who he has conversed with, or both). For example, Big Sean’s network is primarily blue, as opposed to dark orange or purple, which means he talks to a lot of people whom he does not follow. It is also interesting to see which users are in the intersection of the different hip hop artists, and a quick examination of a few of these indicate that they are actually mainly other big figures in the hip hop scene (artists and dj’s, etc. ).